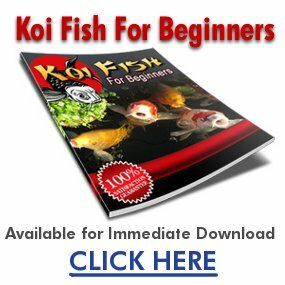 Koi Pond: is Ph Important? It can mean the difference between life and death of your koi fish! • Introducing fish too soon into a newly constructed pond that was not properly sealed; the lime or alkali from the cement will raise the pH to the top of the scale. Even a shovel full of concrete or mortar can cause serious problems. similar materials over a period of time. • Excessive growth of algae. • If the pond alkalinity is from the koi pond being new, allow adequate time for the pond to age. To speed up this process introduce bacteria found in a koi pond starter solution. • If high alkalinity is due to an over-abundance of algae, remove excessive growths of thread algae. Low pH conditions occur less often than alkalinity in koi ponds. • Fish become stressed, resulting in sickness; they may start dying off. • Biological filtration ceases to operate correctly. decrease in buffering agents can create drastic fluctuation in pH. by build-up of decomposing plants and leaves. through the material will pull out the calcium carbonate and raise pH. Wastes and toxins tend to build up in most ponds, despite use of a biological filter. As water evaporates, pollutants remain and build up over time, becoming dangerously concentrated. For this reason it is highly recommended for smaller koi ponds that you drain and replace 20 percent of the koi pond a couple of times a year. Larger koi ponds are generally much more stable and the water chemistry does not fluctuate radically. This water should be siphoned or pumped from the bottom of the koi pond, where the majority of pollutants collect. No more than 20 percent should be replaced since larger amounts could easily upset the balance of the koi pond. This is especially true if the replacement water is softer or contains high levels of chlorine or chloramines. It would also be advantageous to keep most of the rotting debris cleared from the bottom. Decaying fish and pond waste produce ammonia, methane and other toxins which can be fatal to the koi pond family. If you are adding water with a garden hose, it is best to adjust to low volume and a mist that sprays gently through the air before entering the pond. This will allow some of the chlorine to evaporate. If you add the water quickly, add a dechlorinating product to the koi pond to neutralize the chlorine and chloramines. Unless you are adding water to your koi pond by means of an electronic aquafill water leveling system, always use some type of a timer or alarm to remind you to turn off the water! If left unattended for an extended period of time, you could find your pond overflowing and your koi fish dying from chlorine poisoning. It happened to me… several hundred dollars worth! Happy koi, peace & joy.